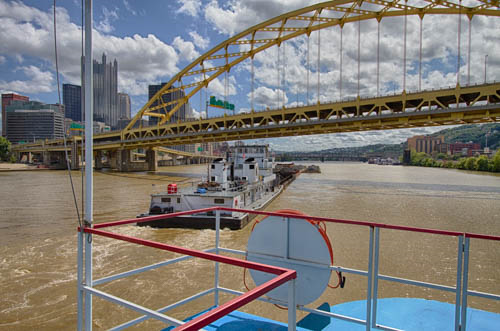 Our explorations begin with a boat tour of Pittsburgh, cruising the three rivers in the center of the city--the Monongahela and the Allegheny which converge to create the headwaters of the Ohio. 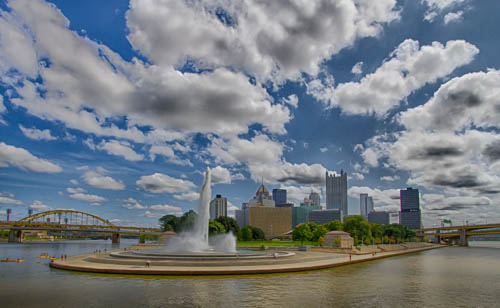 It is a beautiful sunny day, the waterfront is alive with bikers and walkers on paths and in parks along the shores, and kayakers and paddle boarders plying the waters. 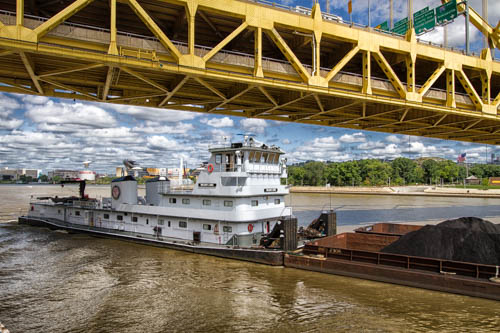 A towboat pushing ten barges passes us, giving us some extra time for photo ops near The Point with its huge landmark fountain. 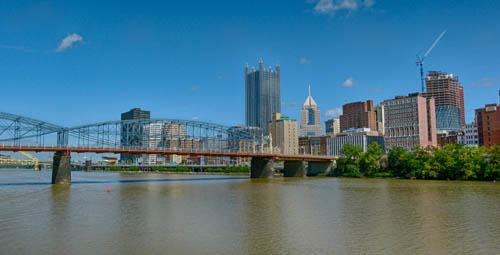 Although we will not bike this far, The Point is the northern terminus of the Great Allegheny Passage, also known as the GAP. After the boat tour, we hop on the Duquesne Incline up to the top of Mt. Washington. Dating back to 1877, its steep tracks rise 400 feet with a track length of 800 feet. We lunch at a restaurant next door to the station at the top. 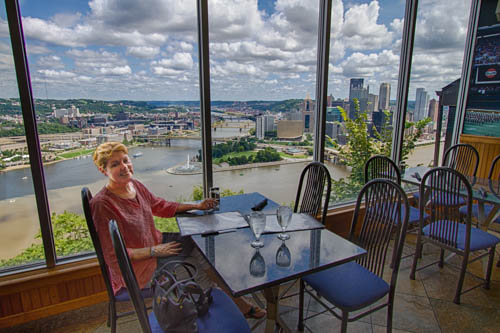 Our table next to a window has a view of downtown Pittsburgh that was reputedly voted by readers of USA Today as one of the top ten sites in the world for viewing a cityscape. After lunch, we return to the incline station, where we pay 50 cents apiece to see the cogwheels and gears driving the cables that pull the cars up the tracks, after which I am, strangely, much more comfortable on the ride down than I was riding up. 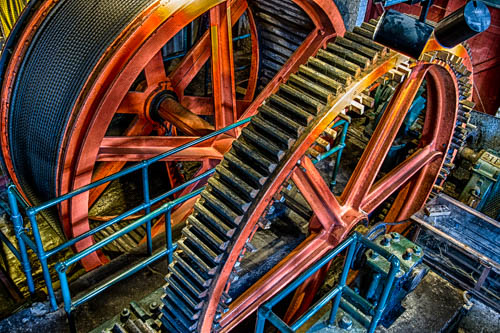 The cogs on the wheels are made of wood, and the pieces holding them in place look kind of jerry rigged. You wouldn’t think this view would be a confidence-builder. 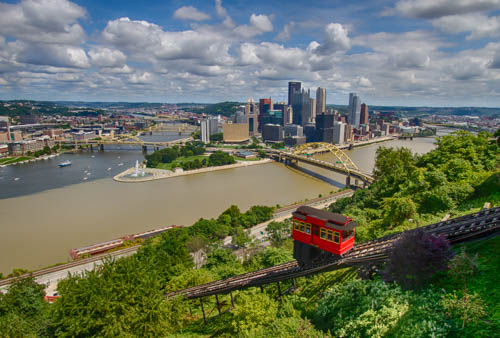 Perhaps the most amazing thing about the incline is that it is privately owned and operated by an association of neighbors who had the vision to save this historic treasure and its priceless contribution to the vibrancy of their neighborhood. Then we are on our way to our Road Scholar Program that begins at 5 pm this evening. Our headquarters for the next four days is a Mennonite Retreat Center in the Laurel Highlands of Pennsylvania. From the minute we park our car, we are reminded of our past church camp days at Lake Geneva Summer Assembly in Wisconsin. There is no lake here, but the cabins and gathering spaces, the dining hall, the craft building all seem strangely familiar--warm memories flow before we even start building new memories here. We check into our Lake Geneva-type room, and meet our co-riders and our enthusiastic leader Angela before a classic Lake Geneva-like buffet dinner in the dining hall. After an orientation and opportunity to get to know our fellow riders better, we are looking forward to riding the trail together, starting tomorrow.